The maniac is unmasked in this gory, nerve-shattering prequel to the legendary classic The Texas Chain Saw Massacre, exploring the chilling origin of the fearsome horror icon, from the directors of the extreme French masterpiece Inside. A young nurse is kidnapped by four violent teens after they escape from a psychiatric hospital, and take her on a road trip to hell. 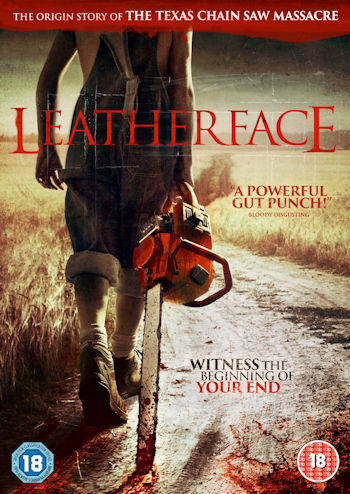 Pursued by an equally deranged, trigger-happy lawman out for revenge, one of these teens is destined for tragedy and horrors that will destroy his mind - moulding him into the monster we now know as Leatherface. The eagerly-awaited home entertainment debut of this slick, sick horror flick will have horror fans drooling with delight. With a fantastic cast - including genre favourites Stephen Dorff (Blade) and Lili Taylor (The Conjuring), as well as Game of Thrones star Finn Jones - this is a worthy addition to the Chain Saw franchise, and a thrilling examination of the genesis of a monster who is ranked alongside Freddy and Jason as one of the greatest horror characters ever. Sam Strike (We Still Steal The Old Way), Nicole Andrews (Homefront, The Penthouse), Sam Coleman (Game of Thrones), Alexandre Bustillo, Julien Maury (Directors of Inside, ABCs of Death) also star.